We install Solar Thermal Panels in Exeter and Exmouth. Solar thermal is a clean, green way of providing energy to homes, solar thermal water heating and panel installation is becoming more and more common across Exeter, Exmouth and the wider Devon area. More and more homes and businesses are choosing to harness solar power to heat the water in their homes, and 4 Seasons' team of experts is on hand to help you do just that. Solar thermal water heating systems use a network of solar thermal panels installed on your roof to heat water for use throughout your home. This reduces the amount of energy needed to run your boiler or heating, and creates an energy surplus during the summer months. This surplus can then be sold back to the national grid to offset the initial installation costs of your solar thermal system. 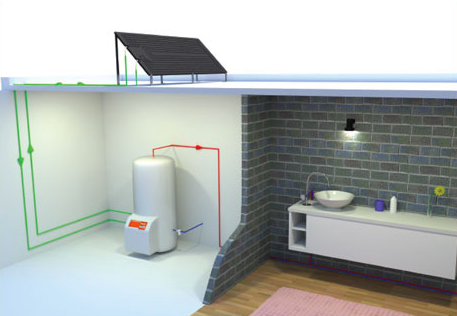 Along with cutting back on fuel costs and reducing your environmental impact, a solar thermal water heating system will also save you money in the long run thanks to its low maintenance and servicing costs. We make use of tried and tested components which dovetail seamlessly with your existing heating systems. These components are hard-working, hard-wearing and only need a check-up every five years. Plus, because solar thermal panels will be doing your boiler's work throughout the summer months, you'll reduce your boiler's workload, extending its lifespan and reducing costs even further. 4 Seasons Solutions' clean energy experts can install solar thermal panels and solar thermal water heating systems to any property, commercial or domestic, anywhere in Devon or the wider South West. But solar thermal isn't a one-size fits-all solution. We need to discuss your needs and requirements, along with your property, so that our installations team know exactly what they're working with. We'll then recommend and fit a system that meets all your needs. The only solar panel that works in the dark. Warm water for the least cost. ENERGIE offers you the enjoyment of sanitary hot water of up to 55 degrees with high energy efficiency and without releasing CO2 into the atmosphere. Additionally, you can also expect a reduction in your energy bill of up to 80%. Maintenance is almost non-existent, ensuring the user and the installer will enjoy absolute tranquility. (Equipment: Eco 280 L + 1 Solar Panel + 1 Thermodynamic Block + 1 Storage heater). Allow comfort to inhabit your rooms. 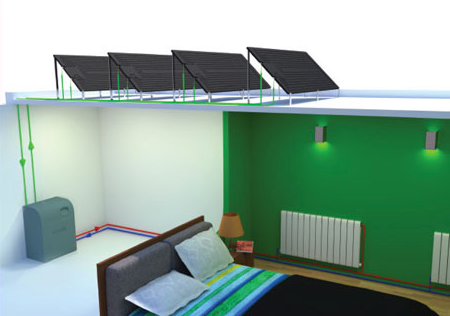 ENERGIE thermodynamic solar systems enable the collection of enough heat to warm a home up to a comfortable temperature, even on cold winter days. 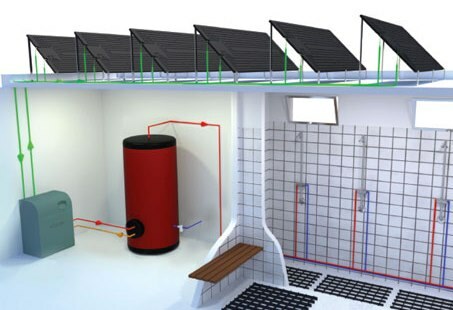 ENERGIE solar systems may also be used in Spring, Autumn and Summer to heat the water of your swimming pool. (Equipment: Solar Clock 4 + 4 Solar Panels + 1 Thermodynamic Block). Enjoyment of the pool, 365 days per year. 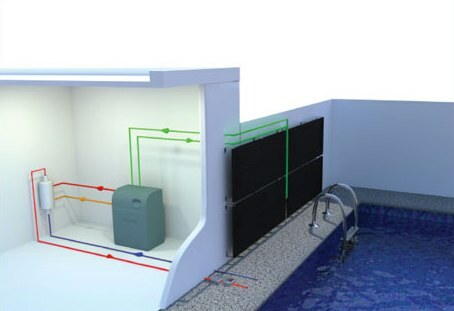 ENERGIE offers you the possibility of enjoying your pool the whole year long with low power consumption. When you choose thermodynamic solar power for your pool's heating, you are choosing a reduction in the costs of maintenance and a healthier environment. Our experience in the production and installation of systems is our guarantee of an excellent service. (Equipment: Solar Block 4 + 4 Solar Panels + 1 Thermodynamic Block + 1 Titanium Heat Exchanger). Traditional boilers can easily be replaced by ENERGIE systems thus reducing the costs of generating hot water. Thermodynamic solar systems for heating large volumes of water are currently installed in hotels, shopping centres, food industries, restaurants, clinics and schools. Expensive? Bulky? Not anymore! SolaX have developed a ground breaking battery storage system and appointed 4 Seasons Solutions as approved installers. The system is affordable, economical, compact, attractive and expandable. SolaX UK and 4 Seasons Solutions are offering a complete package that includes the inverter with the charger and lithium batteries offering up to 7.2kWh of storage all housed in a compact and attractive storage cabinet. This is enough storage to power the average household all night. Intellypower activates electrical appliances automatically when your solar PV installation is generating. This system monitors your energy consumption helping you to reduce your energy bills. They can be retro-fitted to solar PV installations and as they are wireless it means there is minimal disruption. Intelligent hot water systems utilise the energy generated by your solar PV installation rather than it being exported back to the grid. The in-house display gathers information from the generation meter and uses this information to activate the SmartSwitch to power the immersion tank. The SmartSwitch is retro fitted to the heating element and works on a wireless relay. ImmerSUN is the Leading PV Water Heating, Solar Hot Water Switch and Controller Supplier in the UK. 4 Seasons Solutions are authorised immerSUN installers. With IntellyGreen PV see how much money you are earning with your photovoltaic installation, where you want, when you want! Monitoring and control of photovoltaic systems is essential for reliable functioning and maximum yield of any solar electric system. Solar PV monitoring technology enables the use of integrated remote control with real-time performance control, analysis and identification of service anomalies, evaluation of loss performance deviation, metering, corrective measures, and business continuity. Greenologic introduces a "Plug & Play" PV monitoring solution using ZigBee wireless technology. In a matter of minutes you can monitor and benchmark power generation, track income generated and much more.